One of my former professors of Scripture is battling cancer. Please offer a prayer for him. 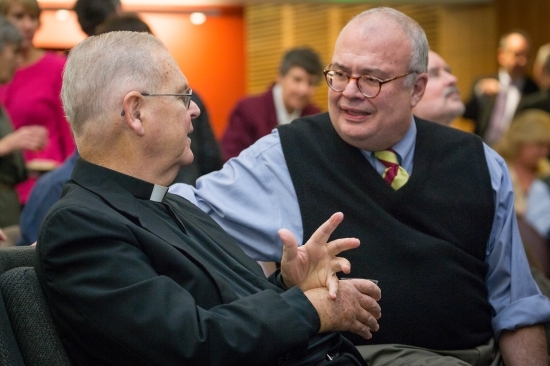 Jesuit Father Daniel Harrington was honored for his tremendous work in sacred Scripture. His notes and wisdom are still fresh in my mind. He is in his final year of teaching; this coming semester he is scheduled to teach three courses. Father Harrington’s many years of teaching, writing and research is a testament to the hard work of faith and reason that we ardently need. The Harvard educated Jesuit priest served as editor of New Testament Abstracts since 1972; edited the eighteen-volume Sacra Pagina series of New Testament Commentaries (Liturgical Press) and wrote “The Word “ column for America magazine for three years. His bibliography, however, is more extensive. Not long ago Harrington and Christopher R. Matthews published Encountering Jesus in the Scriptures (Paulist Press, 2013), a collection of scholarly essays exploring who Jesus was in the first century—and what he means for us today. Putting biblical theology to work for the people of God in the Archdiocese of Boston, Harrington has been on the staff at St. Agnes Church in Arlington and at St. Peter’s in Cambridge.